Price includes: Bed linen & towels, fresh set each week. Pool towels. Internet, water, gas, electricity. 2x cleaning visits per week & exit clean. Compulsory extras: Tourist tax: 1 EURO per adult per night. Over the years Le Luc has proved particularly popular with larger groups of friends and family, particularly those with young kids. Le Luc has also hosted birthday/anniversary celebrations and even a wedding. Short stays are very welcome outside the summer months. 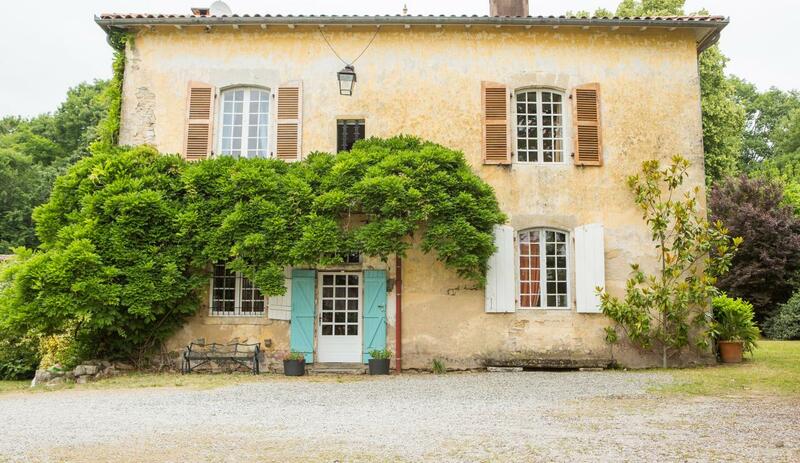 Le Luc is a very charming home in 'French Country' style. 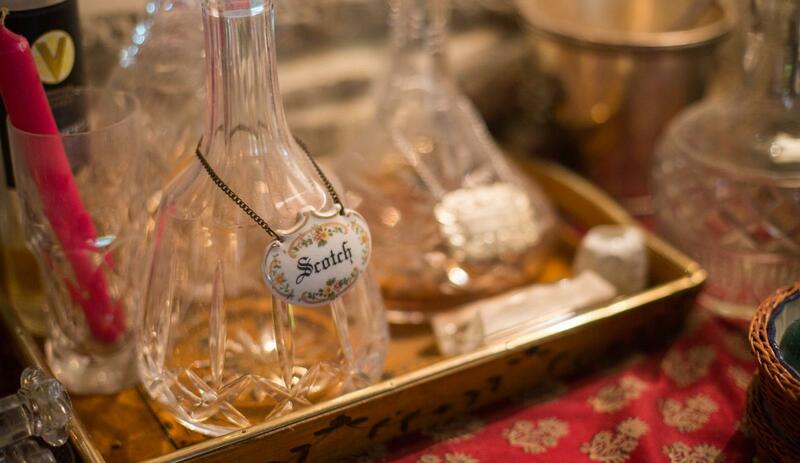 It is used often by the English/French owners and their personal effects are on display - we feel this is at the heart of Le Luc's charm. Note the housekeeper, Stephanie lives in the neighbouring guardian's cottage in the grounds. She's on hand to help you relax and enjoy your holiday. The local area offers tranquil countryside and sleepy market towns but the coast's famous sandy surf beaches and lakes are easily reached by car. This is an excellent base for day-trips too: Spain and the Pyrenees are only a short drive too. 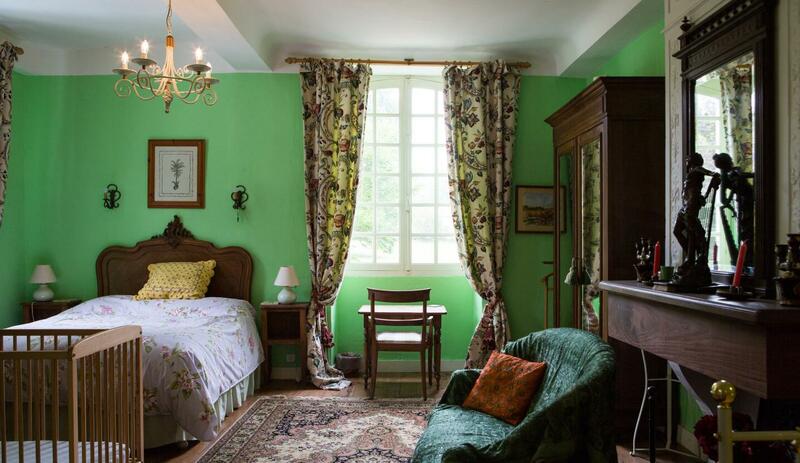 Le Luc is perfect for Francophiles who really want a classical French holiday experience. 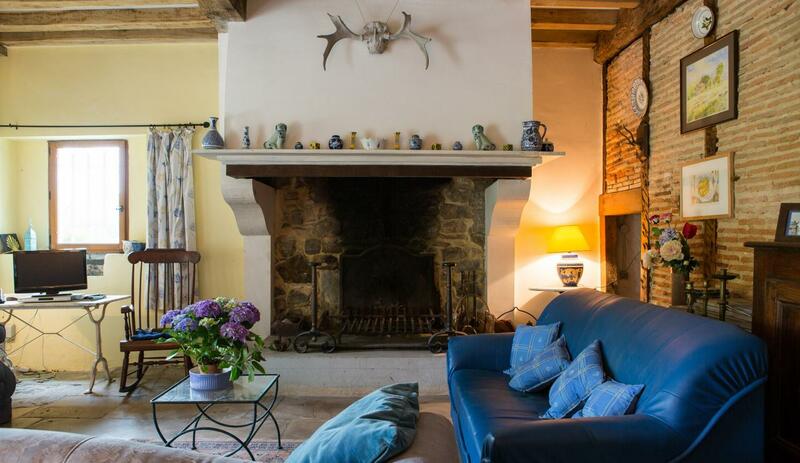 Stone walls, beamed ceilings, feature staircase, imposing fireplaces - Le Luc is the real deal. This is a spacious holiday rental: the interior living space is in excess of 500m2 and is spread over three floors. 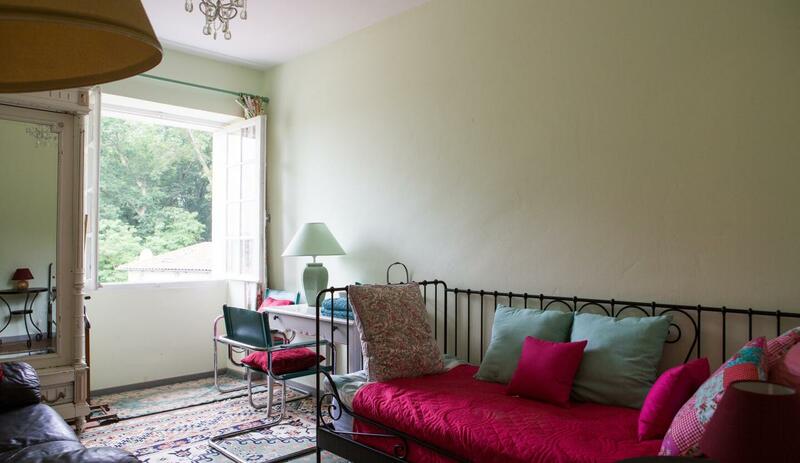 Outside, enjoy 12 acres of gardens and woodland. The manoir is entered via the 34m2 stone floored sitting room. To the left is a feature fireplace (logs provided) with wood-burner. 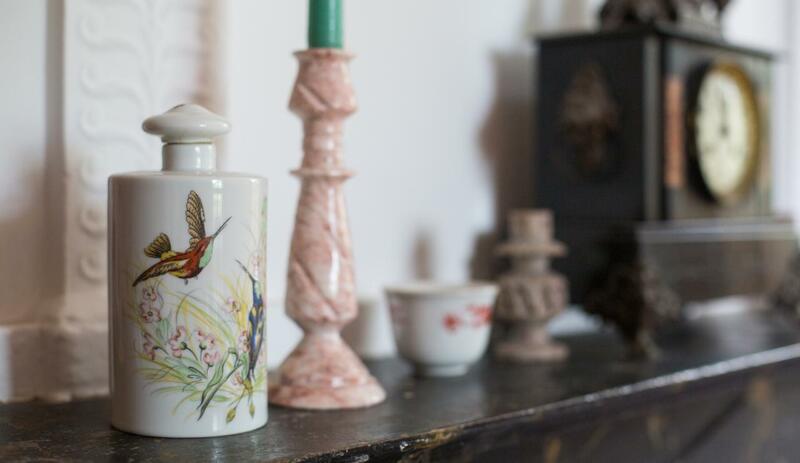 Antique furniture adds to the feeling of warmth and refinement. There is a flat-screen TV (with free-to-view UK channels), DVD and CD player. Adjoining the sitting room is the manoir's dining room. A charming and elegant space to enjoy long dinners, there are two adjoining tables to seat 14 comfortably. Next to the staircase is a handy downstairs WC and in the adjacent kitchen corridor there is a vast sideboard containing a large collection of cooking dishes. 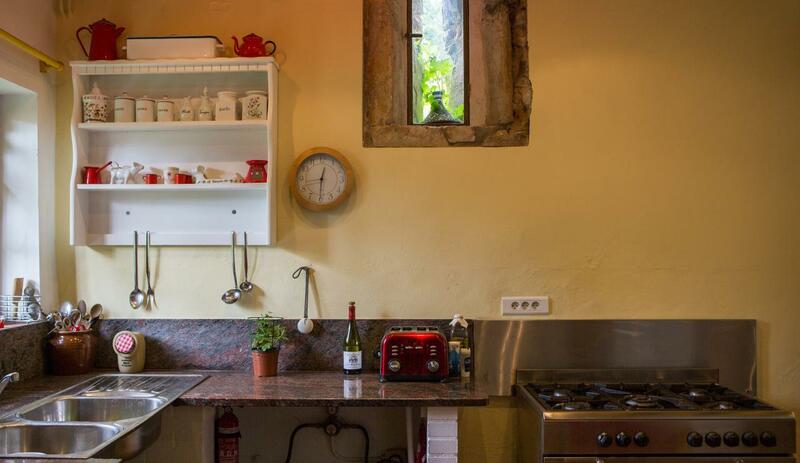 Located off the corridor is the large scullery (16m2) with wine and vegetable racks, chest freezer, fridge, small sink plus garde manger for storing cheese. 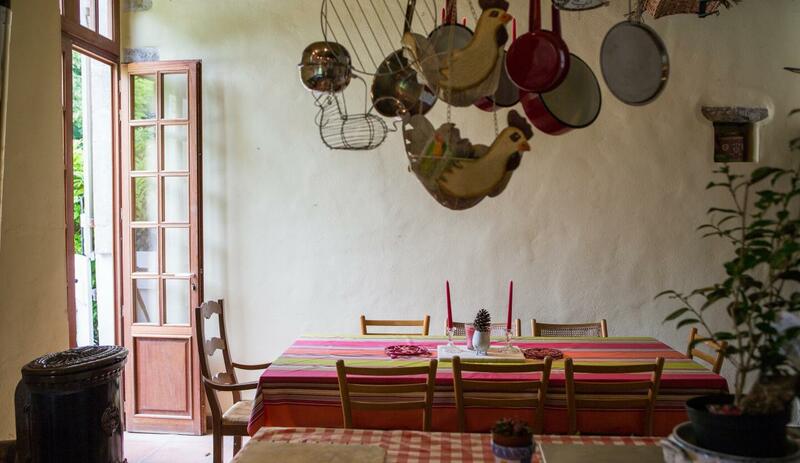 Beyond the scullery is a large (23m2) country-style kitchen. There are two full-length cupboards containing a wealth of dishes and crockery, a long granite work surface with double sink, cooking range, microwave/grill plus a further fridge. Two kettles and two toasters are also provided. The kitchen breakfast table seats 12 and French doors provide direct access to the pool and terrace where meals are taken. 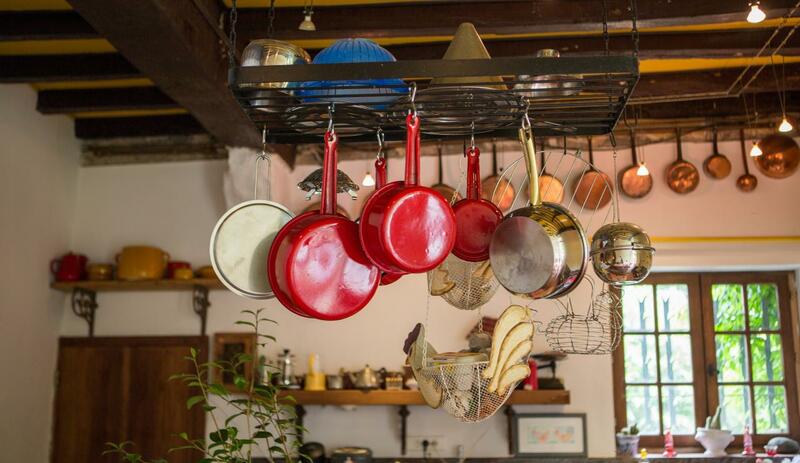 From the kitchen, you enter the 'buanderie' for washing and drying clothes (Stephanie the housekeeper will assist). 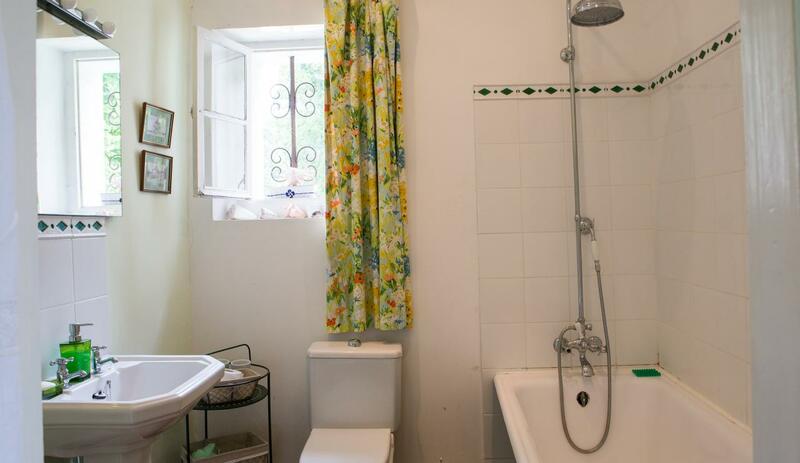 The room also has a butler's sink, pool shower, very handy WC (it saves having to go right into the house with wet feet when you've been out by the pool) and a wardrobe containing pool towels and cushions for the garden chairs, plus ironing board & iron. 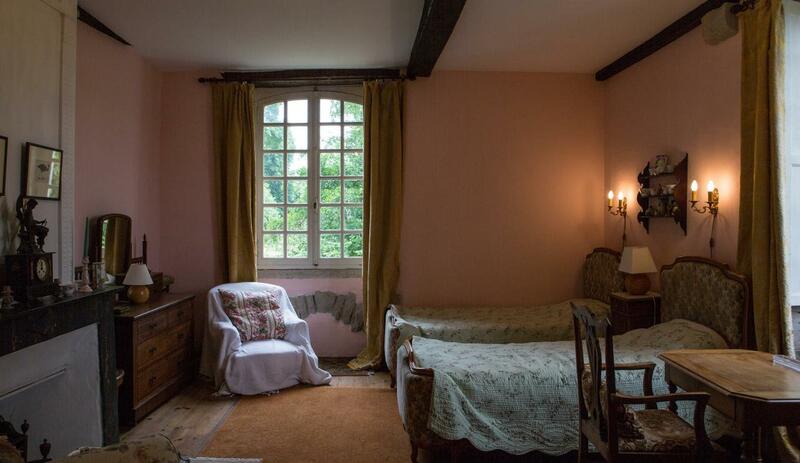 5 of the manoir's 7 bedrooms are located on the first floor, accessed via the 17th century staircase that was purchased from a previous manoir. 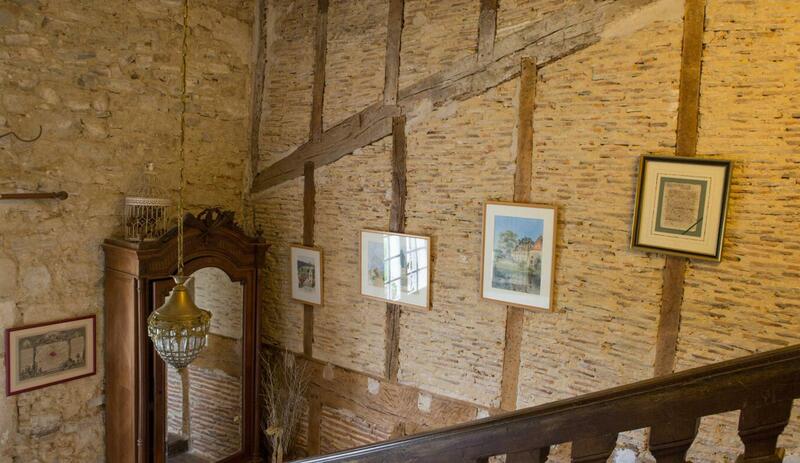 The stairway is wide and imposing and the walls retain the original timber and narrow brickette. On the first floor are 3 bathrooms with toilets, a shower room plus a further separate toilet. 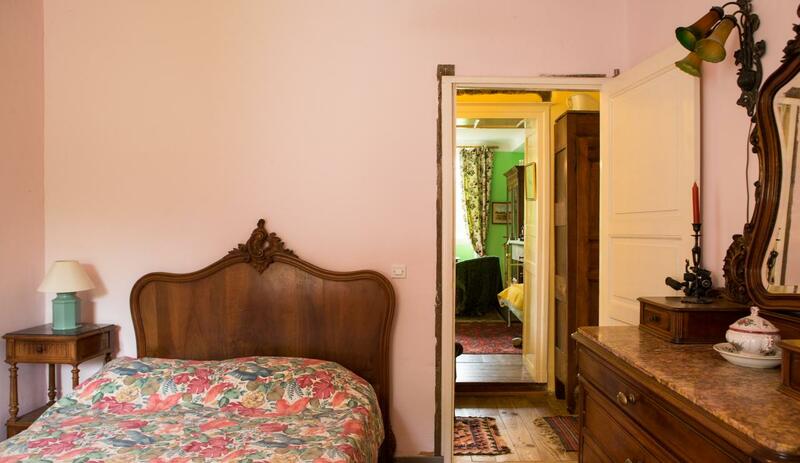 All bedrooms have period furniture, armchairs or sofas, and a selection of ornaments, rugs, etc. Master Bedroom - "Gingko" - 36m2. King-size bed with en-suite bathroom plus dressing area. Superb marble fireplace plus antique furniture including a colonial desk. Sofa in the room. Double Bedroom - "Oak" - 36m2. King-size bed and single bed plus en-suite bathroom. Double Bedroom - "Art Deco", private shower and wash-hand basin. Double Bedroom - "Magnolia" - 31m2. Twin beds plus extra single. 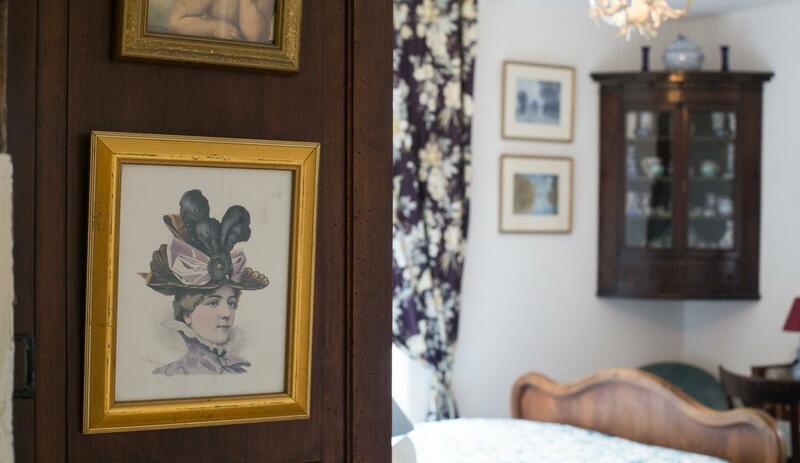 The owners kindly request that due to the antique furniture in this room, extra care is taken if the room is used by children. Double Bedroom - "Grey" - 21m2. Double bed plus walk-in cupboard. The Magnolia and Grey bedrooms share a bathroom. Also on the first floor there is a small study room stocked with a few books, a sofa and day-bed. 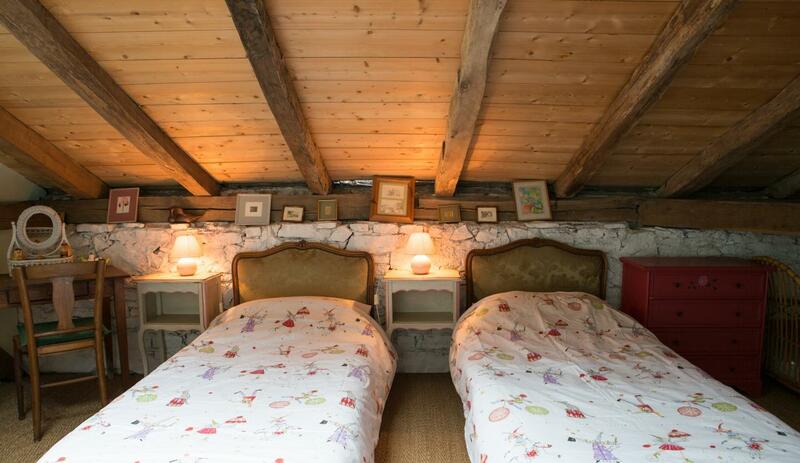 The attic 'dorm' is a fun place for the kids to sleep - there are two very large children's bedrooms each with twin beds and bunk beds. A selection of children's toys and games is also available and there's a large TV salon too. There is a handy WC, shower and wash-hand basin serving the kids' rooms. 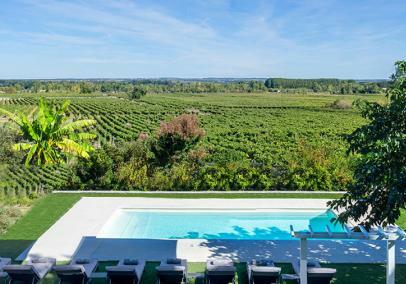 le Luc offers 12.5 acres of grounds to enjoy (5 ha). The grounds to the rear of the house are dominated by the magnificent 400-year-old oak. The floodlit heated swimming pool is a generous size (10x5m, floodlit; Roman steps; depth 0.9m - 2.0m) and is protected by a security fence with lockable gate. 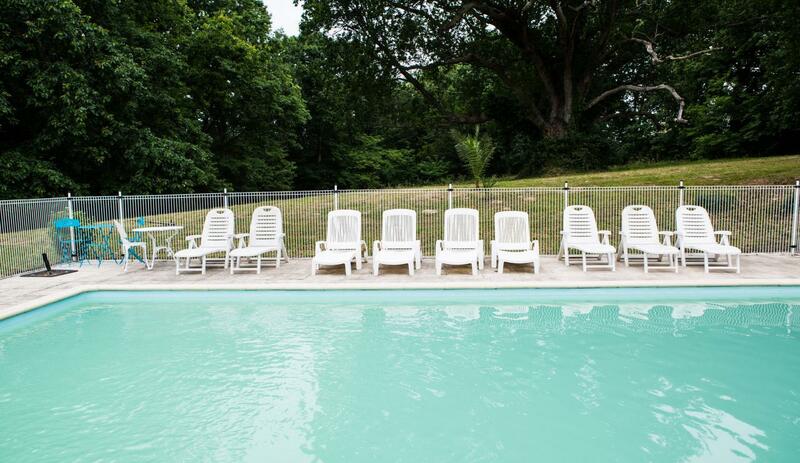 The pool has a wide, paved surround with numerous sun-loungers. Adjacent to the pool is a gravelled terrace with two oak teak tables each with 8 chairs, 8x loungers, and easy chairs plus additional tables. This is a wonderfully secluded retreat for lunches and dinners with a gazebo cover. A BBQ is available - try one of the cook's specials. For the younger children there are many smaller chairs and a covered sandpit near the pool. 4x doubles, one of these rooms has an extra single bed; 1x twin with extra single; 2x attic children's rooms each with twins and bunks. 10x5m heated & floodlit; Roman steps; depth 0.9m - 2.0m; salt filtration; protected by security fencing with lockable gate. Services typically include catering, shopping, babysitting and housekeeping. It has proved easiest for guests to discuss their requirements directly with Martin and Maryse who will explain options and prices. The services are provided by Stephanie, the owners' daughter who lives next door with her family. Stephanie cooks wonderful meals and can really help make your stay a special one. In the very busy weeks, they are usually joined by Martin & Maryse, the owners of Le Luc. Don't forget that some cleaning is already included in the rental price - the house is cleaned twice a week (not kitchen dishes). 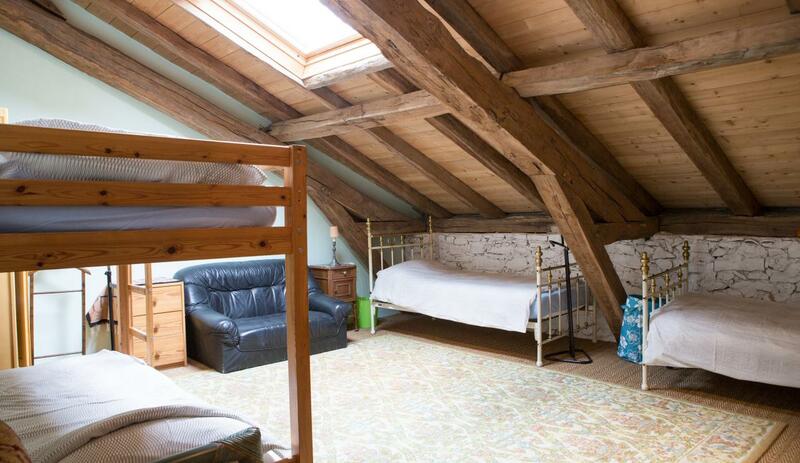 Also included in the rental price is a change of bed linen and bathroom towels each Saturday. A comprehensive information pack is provided for arriving guests. This details emergency telephone numbers, chemists, banks, supermarkets, festivals, markets, day-trips and excursions, etc. A welcome basket is also provided. This contains a dozen fresh eggs; butter; 2x bottles mineral water; 2x bottles wine; 1x bottle fruit juice; 1x packet pasta; ham; 3x baguettes. Guests can also request an arrivals shopping list to be purchased via the Assistant de Vacances - please order this a minimu of 2/3 days before arrival. For the little ones there's a total of 5x cots, 5x high chairs, 2x buggies, 1x booster seat for a car, 2x baby baths, 2x changing mats and 2x potties, assorted children's crockery, bibs, juicer, flood blender, steriliser, plus a covered sandpit and inflatable pool toys. 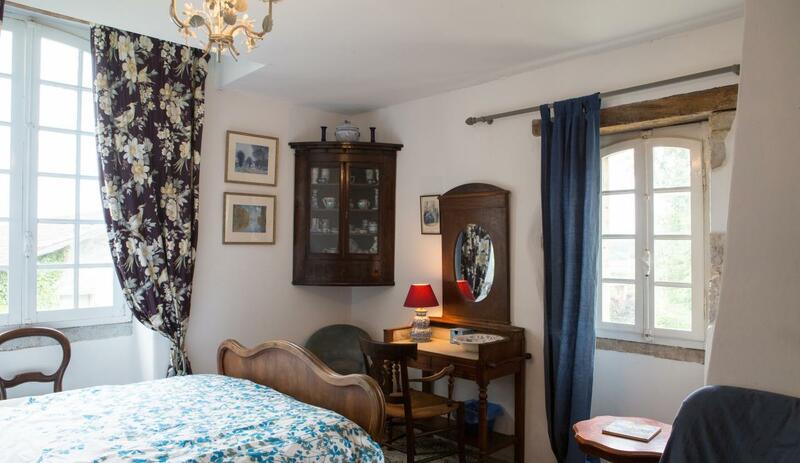 Le Luc is situated in the village of Ste Marie-de-Gosse, between Bayonne and Peyrehorade. The area marks the border between the flat, pine-forests of Les Landes to the north and the Pyrenees to the south. 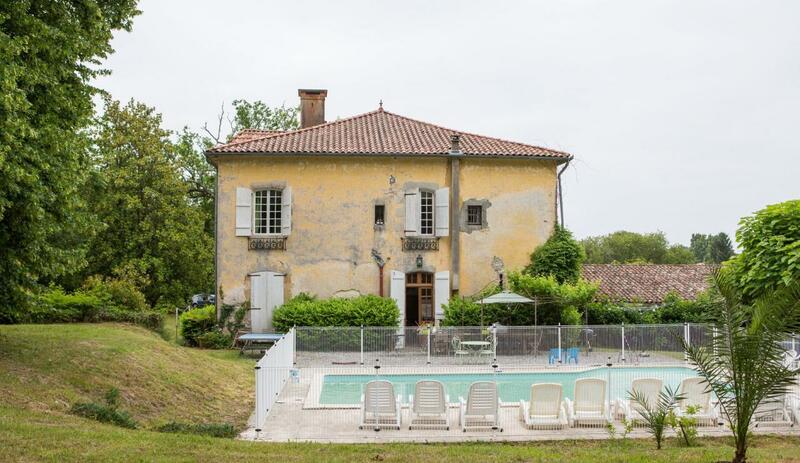 This is gentle, rolling Gascon countryside dominated by the Adour river and punctuated with charming villages and market towns. 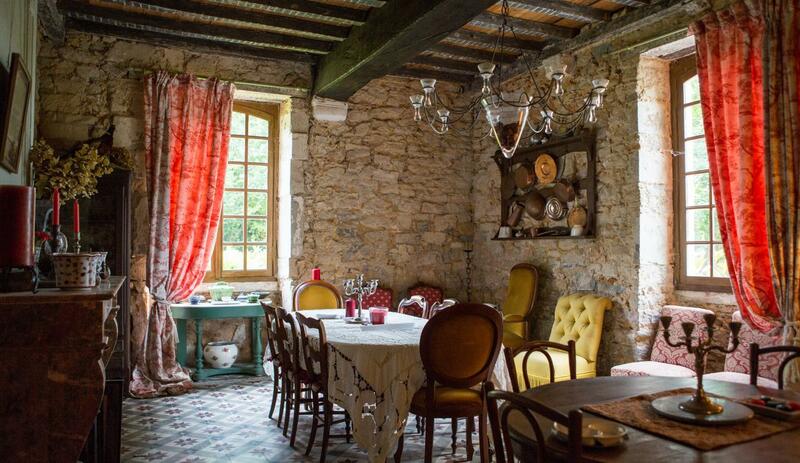 Le Luc itself is in peaceful and very private surroundings, set back some 100 yards from the nearest road. It's a typically French countyside setting but the beaches and resorts of Biarritz and Hossegor are easily reached. Boulangerie: St Martin de Hinx 3 kms. There's a 'depot de pain' in the village shop and a bread delivery service is available. Service: Thanks to Alternative Aquitaine's help, expertise and service we found the most wonderful place to celebrate this summer. We are super happy with everything from start to end. The process was smooth and we got all the information, advise and help we asked for very promptly, despite living in Sweden. 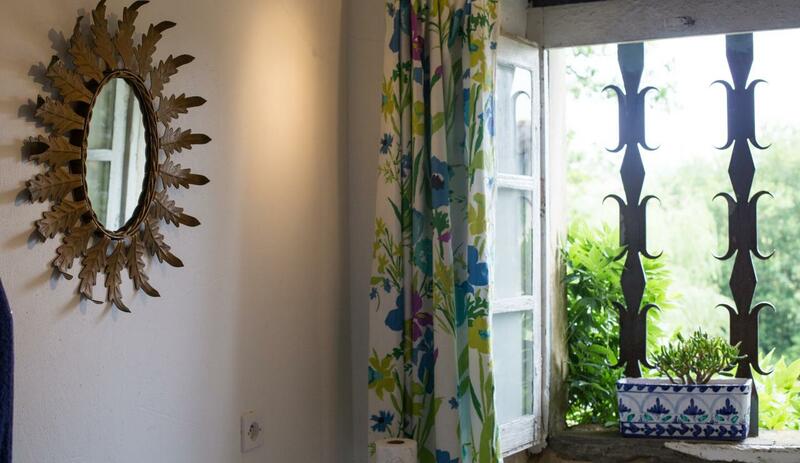 We highly recommend Alternative Aquitaine. Thank you! Product: This place is pure magic. 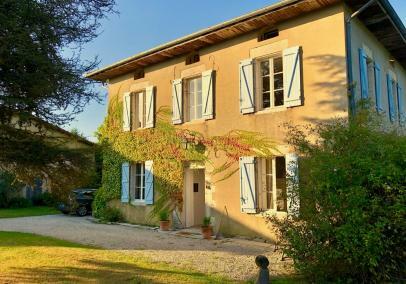 It's a beautiful house with a fantastic history and amazing location in the village of St Marie de Gosse. The hospitality, help, advise and kindness of the owners' is phenomenal. 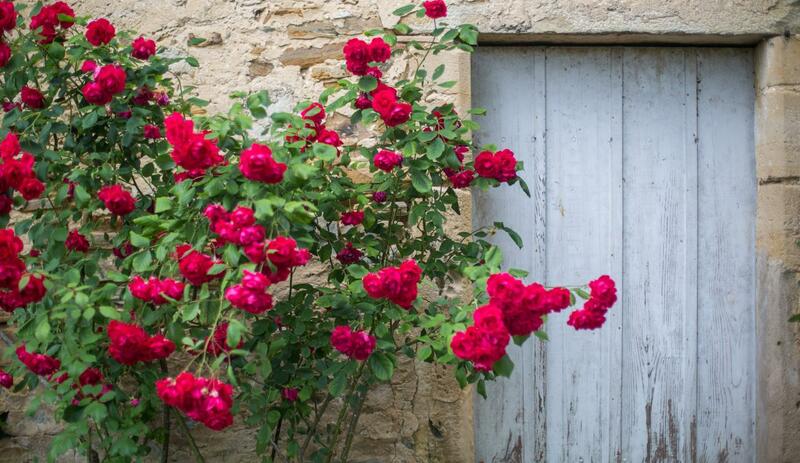 We highly recommend this place to others, especially if you enjoy genuine French countryside. Product Comment: What a pleasure to read this. It's lovely to hear from a guest who truly 'gets' the Le Luc experience. Thanks very much for sharing your thoughts. Service: The best agency I have used. They were responsive and helpful and did an excellent job of communicating with me and answering any questions I had. I particularly liked that they notified me that one item was expected to be delayed but not to worry, I would receive everything in time for my departure. I stopped worrying and I di receive everything in plenty of time. 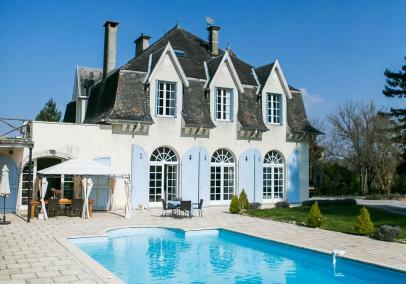 Product: What a wonderful rambling French country house! 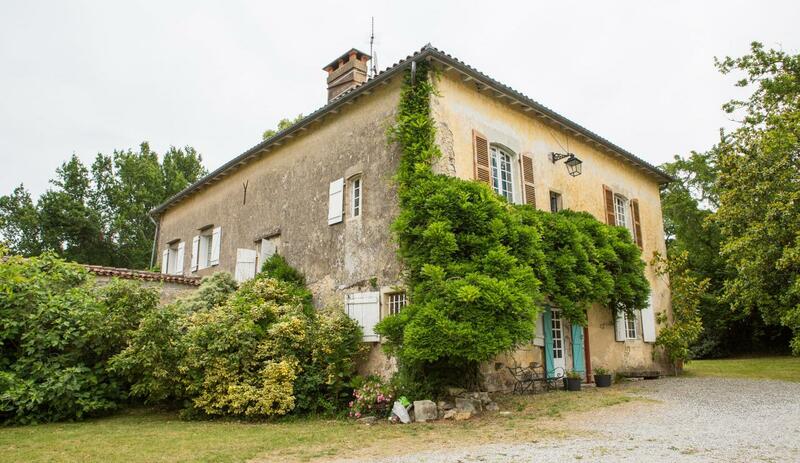 Built in 1748, it is just like those French country houses in the movies. The rooms were great, the pool lovely, the property huge and private, the hosts so helpful but never intrusive. There is plenty of room for groups larger than ours (13 people) and the equipment in the kitchen was perfect for feeding a large crowd. A treat to have the house dusted and vacuumed every couple of days. We had two wonderful weeks - special thanks to Martin, Marys and Stephanie! Service: AA was very helpful, arranging details that were exceptional. Thank you. The booking went smoothly. However, info on reaching the house needs updating, road numbers in France have changed and compared with maps and sat-navs, are misleading. Plus one or two other details are now incorrect. Product: We loved the property; there was lots of space for all 17 of us, with large bedrooms for adults and huge attic bedrooms for the children. The pool was excellent and gave hours of fun. The service/care taken of us whilst there was excellent.